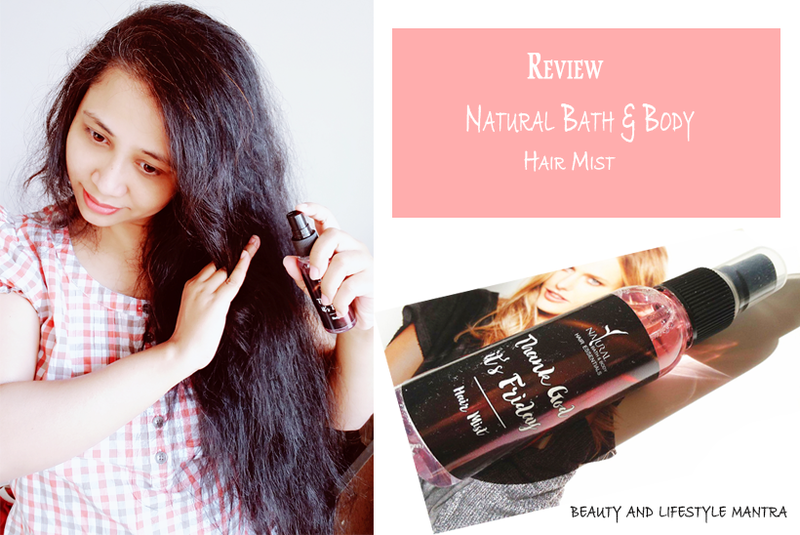 Today I am going to share my experience with Natural Bath & Body Hair Mist. I received a sample size hair mist in my December 2016 Fab Bag. This is the very first hair mist I have ever used. Natural Bath & Body Hair Mist comes in a 50 ml transparent plastic bottle with a spray applicator and a little plastic cap. It’s a sturdy, lightweight, fairly handy size and would be good for carrying around in a bag. The packaging is cute. But when I put it in my bag, the cap on it comes off easily, but none of it accidentally gets sprayed in my bag while the cap is off. It looks light purple in color inside the bottle, but you don’t really see the color because it comes out in a fine spray. Once you spray this, you immediately notice the smell, while it’s not unpleasant it definitely does remind you fruity juicy and a very sweet fragrance. I've used it both on damp hair and dry hair. However, more I like to use on my dry hair. I don't spray it too close to the hair just shake the bottle before use, then hold the bottle 10-12 cm from my head and spray evenly. I spray the mist all over my hair and 2-3 sprays are enough for my medium length hair. Once you put it into your hair you can’t really feel it, and it absorbs into hair so quickly. This spray leaves my hair looking shiny. It doesn’t make hair sticky as well as doesn’t dry out the hair.The scent lasts all day without being overwhelming from the time of application to the end of the day. Overall, I love this fabulously scented hair mist. This is a really nice, non greasy and long lasting. This is the very first hair mist I have ever used, so I do not know how it compares to other hair mists. But you'll love it. I recommend this hair mist to everyone and this is a good hair perfume for to give as a gift. Have you ever tried this or any other Hair Mist? What did you think? Hope you've all been enjoying the Spring and Holi season! Lovely hair you have Anamika. Never tried any hair mist.. This one sounds interesting..
floral *scent loving* nose! oops mistake!